Conversion rate optimization for e-commerce luxury goods differs from optimization of other websites. It has its own hidden traps and pitfalls that you need to account for in order to increase online sales and make your ecommerce optimization successful. Ready to find out the ins and outs of how to optimize a jewelry eсommerce page? First, we need to understand what are the core motives of the users in buying high-end products. 88% of consumers consider quality as the most common reason for buying luxury products, according to a 2015 Deloitte survey. The second most popular response was that high-end goods make the buyer feel happy or confident, the third popular response was explained by the fact that people purchase lush items as a status symbol. Here are 5 jewelry sales tips that will help you increase website sales of your luxury jewelry store and pictures of examples where is possible to improve CR from jewelry websites. If you found your website among the examples below, don’t be mad with us, take it as free advice on sale-boosting and improving your website. Some design elements lead people to believe a website is luxurious. For example, an expensive brand associates with a minimum number of colours and a lot of white space. Bright colours work for marketing activities of many brands, but not for the high-end products. Yellow, red, and green colours correlate with daily-use products and bright pricetags in a supermarket rather than with Cartier watches on a sophisticated jewelry ecommerce page. Luxury goods buyers have high expectations for providing information and details on the selected high-end products. One image and a piece of basic information in the description won’t be enough for a customer to make a decision. They want to see the item up close, it’s shine, the way an item will look like on them in real life. 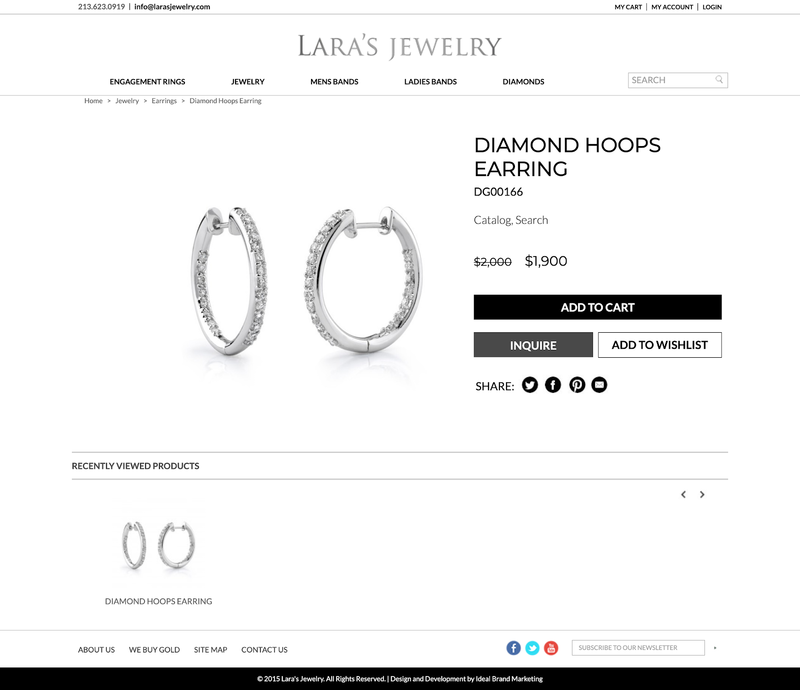 To optimize a jewelry ecommerce page, you have to make sure your cart page includes a picture of a product on a model. Another ecommerce sales growth tip is to put a short GIF or a video of an item in movement with nice light so they can vividly see that sparkling. Detailed information should close all possible questions about a product. It should provide not only basic technical information, but also sizing charts and recommendations on how to style the product. For a luxury jewelry website, nothing says “cheap” like 8 popups with discounts and subscriptions before you even enter a website. Try using these ecommerce sales and marketing techniques in another manner and don’t interrupt the special experience of a user while they are exploring your website. Same as with pop-ups, if you want to create a luxurious feeling and looking jewelry ecommerce website, don’t use ecommerce sales techniques which make your online store look inexpensive. No matter where customers eventually buy high-end watches, they probably did some research on their phones beforehand. 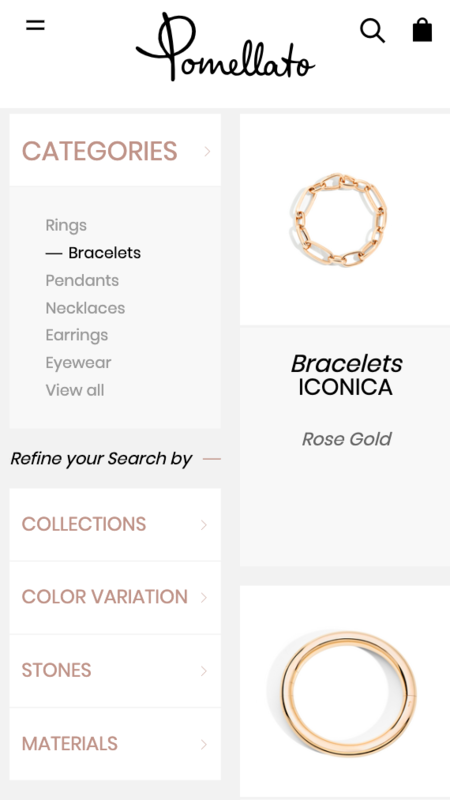 Here’s a jewelry ecommerce page tip – keep that same simple elegance that you have on a desktop. Only one product being displayed, a few colours, lots of white space. It should be easy to navigate within your ecommerce website menu. And of course, we recommend to A/B test all your ideas to get the best results from the optimization.